It would be an understatement to say that we live in challenging times. We wake up to daily news headlines that bombard us with demands for economic growth and the ability to stave off global competition. Today, as never before, Americans look to our nation’s business community to create innovative strategies for providing jobs and bolstering American competitiveness in the global marketplace. High school dropout rates are much too high. Many high school students are disengaged because they can’t connect what they’re being taught in the classroom to the real world or future careers. Secondary-to-postsecondary transition rates are too low and postsecondary dropout rates are too high. Too many college students require remediation. Along with these challenges that threaten a seamless pipeline from high school to college, demographic shifts are making the education enterprise more challenging every day. Our student population is more diverse in many ways, including a broader range of learning styles and needs. Yesterday’s educational system is inadequate to meet today’s realities. 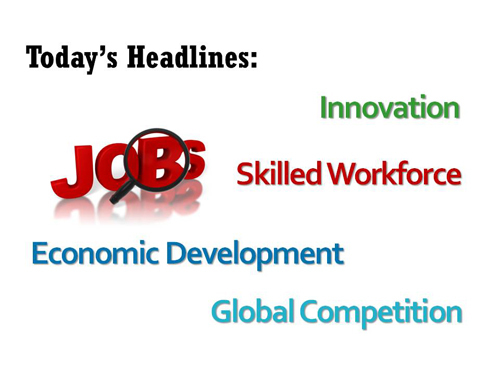 Let’s take a look at what will be required for employment in the next few years. 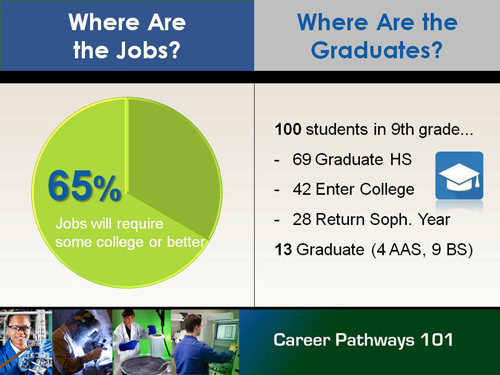 As this graphic indicates, by 2020, 65% of all jobs will require “some college” (an industry certificate) or better, yet you can see that as a nation, we are not graduating enough students to enter that college pipeline, much less complete it. As students progress from one level of education to another, they exercise choice in determining what directions they will take and how far they will go. The reason many employers struggle to find qualified workers is that the pipeline has become weak. Too many students exit before they have gone far enough to gain the skills necessary to meet the needs of employers. This dire situation should certainly give us reason to pause and reflect. Unfortunately when we do, what we see is a gaping skills gap. Career Pathways offers a promising approach to narrow that skills gap by plugging the leaky pipeline from high school to college. …a coherent, articulated sequence of rigorous academic and career/technical courses, commencing in high school and leading to an associate degree, baccalaureate degree and beyond, and industry-recognized certification and/or state regulated license. Pathways are developed, implemented, and maintained by partnerships involving employers, educators, and community leaders. Career Pathways are available to all students, including adult learners, and lead to a rewarding career. Any career pathways program should connect three key components—secondary, postsecondary, and employer. Purpose—A career pathways program that results in credentials and jobs can motivate students to stay in school. Rigor and relevance—Career pathways are academically rigorous and teach content in the context of the world of work. A level playing field—Career pathways take into consideration a broad range of student learning styles and needs. Guidance for career selection and a foundation for career pursuit—within a career pathways model, every student has a sense of direction. Every course, every concept leads toward an identified career goal. Opportunities for problem-solving and critical thinking—Career pathways programs emphasize employability skills, producing “knowledge workers” who understand systems and can solve problems in teams. A foundation for lifelong learning, and lifelong earning—Career pathways provide a logical, non-duplicative progression of learning opportunities with multiple on and off ramps. 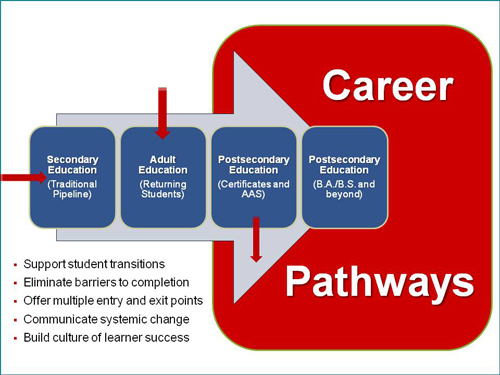 Above is a snapshot of a Career Pathways system that supports student transitions between educational levels and results in postsecondary credentials. Each entry and exit point is critical to ensuring learners benefit from a well-connected series of instructional opportunities that are intentionally designed to give them a broad set of foundational skills as well as the specific technical skills needed to be successful in high-demand occupations. Whether a learner is in high school, and they’re entering a program from what we would consider a traditional pipeline, or a learner is an adult who may or may not have yet completed their high school education, there is an on-ramp for them and multiple steps on the pathway that allow them to earn credentials, certificates and degrees – go to work – and return as needed for further education. Ultimately, career pathways build a culture that enables learner success. 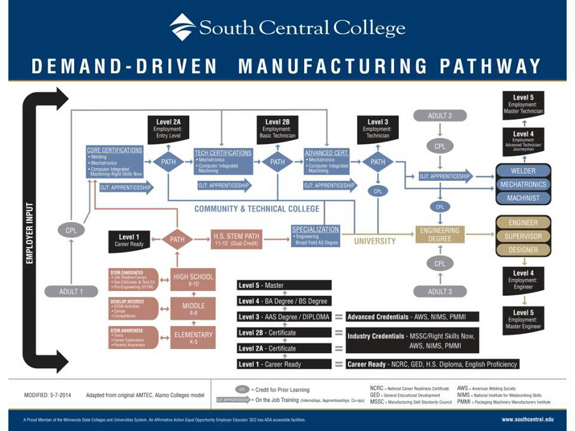 Above is a detailed example of steps along a career pathway from South Central College in Minnesota. This career “map” depicts the multiple entry and exit points of a career pathways program in manufacturing, spanning K-12, community college, adult education, apprenticeship, and university levels of education and training. It also identifies the academic and industry credentials earned at each level. Regardless of the terminology used or model implemented, career pathways are about making it easier for all learners to succeed in education and careers, ultimately strengthening our workforce and economy. Career pathways smooth the road ahead by eliminating roadblocks, streamlining services, accelerating instruction and providing the support needed by learners of any age to stay the course. How you choose to gather and combine these ingredients will be based on local economic climate, employer demand, capacity of your educational institutions, and buy-in from community stakeholders. In the next module we’ll discuss how partnerships with your stakeholders will build the foundation for your career pathways efforts and help guide the development of your unique local “blend” of career pathways.